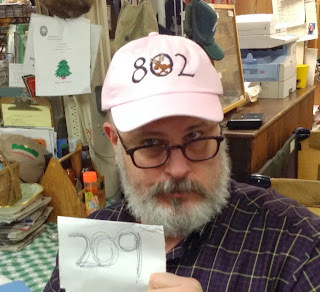 Day 209 / Hat 209: Pink baseball-style cap with black embroidery that reads "802" with brown embroidered moose detail in the middle of the "0." For those of you unfamiliar with such things (I swear I've mentioned it in prior posts but looking back I see no evidence) 802 is the area code for the Green Mountain State. Yes, that's right -- the entire state. And, despite there being several moose warning signs along the various and sundry byways of this southern stretch of the 802, I have never, in all my years here, actually seen a moose on the loose. So today's winter solstice hat tip goes to the Wayside -- with an assist to Liz!